It’s interesting how “history” becomes accepted. I started researching something as simple as the beginning of the K&K Fishing Derby. I have now read conflicting articles from the 1940’s, 50’s, 60’s and 70’s. I have seen pictures and read accounts that are incredible. It does seem, though, that dates and recollections of times can easily vary, and yet, they blend together. One thing is clear: the story of the “Kootenay Rainbow” being introduced to Lake Pend Oreille is both fascinating and unbelievable. I don’t presume to claim what follows are the true facts, only the history as I have sorted through it. Back in the late 1930’s, a number of Sandpoint anglers made several fishing trips to Kootenay and Trout lakes in British Columbia. There, they found a fighting fish that so impressed, that they began to envy their northern neighbors. Plans were hatched by these fishermen, who were also members of the Bonner County Sportsmen’s Association (BCSA), to investigate the possibilities of transplanting these “giant rainbows” to their own backyard, Lake Pend Oreille. Among these farsighted fishermen were Jim Weaver, Wray Farmin, Laurin Pietsch, Ross Hall and Ross Brown. To make a long story short, after two years their lengthy negotiations resulted in the acquiring of 100,000 eyed eggs from the Kaslo Rod and Gun Club’s rearing ponds. These eggs came from spawn taken at Gerrard, B.C., on the Lardeau River just where the stream breaks out of Trout Lake. These precious eggs were brought to Sandpoint in June 1940 by Ross Brown, then-superintendent of the Sandpoint hatchery of the Idaho Fish and Game Department. Out of that first batch, only 2,500 fry survived a virus to make it to the lake in 1941. there was no evidence that any ever survived to become catchable fish. These were a determined bunch of fisherman though, so after more tough negotiations, the Canadians agreed to another 100,000 eggs in the spring of 1941. So as not to “put all their eggs in one basket”, 25,000 were shipped to the warmer waters of southern Idaho at Hagerman. The remaining 75,000 were kept in the Sandpoint hatchery. This foresight was probably what saved the whole plan. Disease again struck the Sandpoint hatchery, of which only 5,000 fry survived. The southern batch had 15,000 survive. They held onto these fry until the early fall of 1942 when they were 6 to 9 inches long. So the first successful plant was 20,000 fingerlings, with a few held out as brood stock. Meanwhile, after again seeing our disappointing results, the Canadians were now even more extremely reluctant to relinquish any more eggs. However, we again persisted (international negotiators of today could have taken a real lesson from these determined fisherman) and got another 100,000 eggs from the Kaslo Rod and Gun Club. This time, 75,000 eggs were sent to southern Idaho and its warmer waters, and the remainder were put into the Sandpoint hatchery. From this batch, about 60,000 to 80,000 (depending on which articles we believe) were planted in the spring and summer of 1943. According to some writings, these were the last Kootenay rainbow eggs we were able to procure until the mid 1980’s. Although, I uncovered some articles where in 1945, negotiations between the Bonner County Sportsmen’s Association and the British Columbia Game Commission resulted in an interesting agreement. We were allowed to construct some spawn taking pens on the stream coming out of Cahill Lake near Slocan, B.C., that fed into Kootenay Lake. The arrangement was that we would get the first 250,000 eggs taken, and anything above and beyond that would be split evenly with the Canadians. After four years, the traps and equipment were to become the property of the British Columbia Game Commission. More research is needed to find out the results for these endeavors. I did read where the traps were constructed but not how many eggs were collected. The importance of the brood stock that had been built up out of the 1941 and 1942 shipment of eggs should not be over-looked. It is attributed to be the salvation of the entire Kootenay rainbow program. It was determined that the brood stock did much better in the colder waters of the Panhandle of Idaho, so they were transferred north to the Clark Fork hatchery. At one time in the early 1960’s, reports of as many as 1,000,000 eggs were taken from these brood fish. The year of 1945, fifty seasons ago, was when the potential of this fishery began to be realized. The first rainbow season on Lake Pend Oreille was a shocker. The fish that were caught were known to be only four years old, right? That first week of the season, L.F. Schnell of Hope weighed a rainbow of 26 pounds. Conflicting articles report that the world record of the time was either a 26.5 pound rainbow caught in 1916 or a 29 pound steelhead caught in 1930 from the Chehalis river in Washington. Most articles I’ve read refer to the 26.5 pound rainbow. Either way, Schnell’s fish announced bigger fish were to come! That same week several fish weighing 9 to 19 pounds and one at 24 pounds were caught. 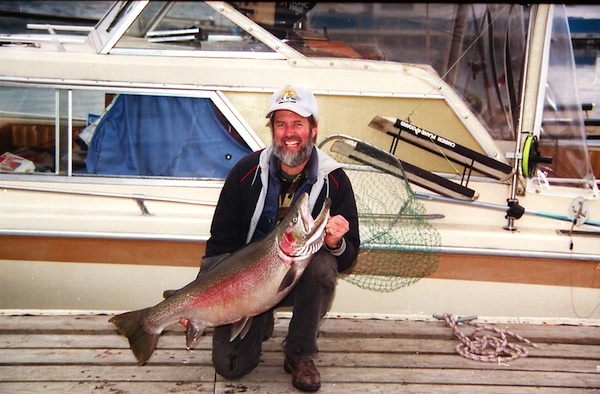 The next week, a 25 pound rainbow was caught along the Midas Garfield shore. 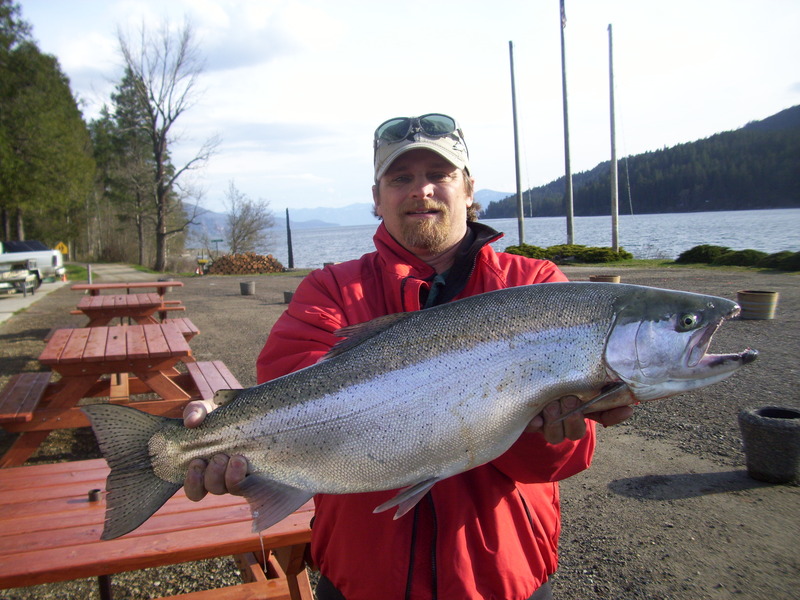 Later in the spring, Ivan Harruff of Spokane caught a 27.5 pound Kootenay rainbow out of Lake Pend Oreille. It is interesting that the articles in these years referred to these fish as Kootenay rainbows. It wasn’t until 1947 that folks really began referring to them by the more misleading generic Canadian rainbow name of Kamloops. July 15, 1945 was the real eyeopener. At about 7 pm., Laurence Hamilton of Reardon, Washington and his wife were trolling out of Garfield Bay. He had about 300 feet of 48 pound test line out when one of these gigantic rainbows hit his lure and took out another 300 feet of line. It eventually became the new world record of 32 pounds 8 ounces and was only 36 inches long. This is another interesting piece of histroy I uncovered. The July 26th newspaper displayed a picture of this fish, the fisherman and witnesses, but the caption and article referred to the weight as 30 pounds. In December, Field & Stream’s annual fishing contest reported that E.W. 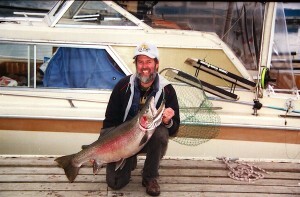 Driesback of Garfield Bay held the new record with a 31 pounder caught on October 15. He was using 18 pound test line and a spoon let out about 200 feet. The fish jumped about eight times, took out another 200 feet of line, and gave about a 25 minute fight. This fisherman had also caught fish of 25, 23.5, 20, and 17 pounds since June of that year. Ted Trueblood, sportswriter for Field & Stream, convinced Laurence to submit his fish in the contest. Witnessed affidavits were submitted testifying the fish officially weighed 32 pounds 8 ounces, and interesting gain of two and half pounds in six months. So anyway, the top three prizes of the year came out of Lake Pend Oreille, all larger than the long-held record rainbow. Due to the tremendous fishing success of the first rainbow trout season in 1945, at the November 22nd meeting, the Bonner County Sportsmen’s Association voted to sponsor a big fish contest. Plans were made to have a promotion that would put Lake Pend Oreille on the lips of fishermen throughout North America. They knew they had accomplished something great and wanted to promote and expand their new fishery. By opening day of the next season, a six month derby was organized. It was called the Lake Pend Oreille Fish Derby, the Lake Pend Oreille Rainbow Derby , and even Rainbow Days. it had a $1.00 entry fee and would pay out an advertised $1,500. First place would receive $250.00, second $75.00, and third $50.00. There were eventually over 100 prizes such as sporting goods and equipment (sleeping bags, Pendleton Blankets, fishing rods, reels, and tackle, auto accessories, groceries) etc. The largest prize, which was among those drawn for just buying an entry form, was a 5 horsepower Johnson motor and a 16 foot boat valued (depending on which article you read) between $325.00 and $375.00. The Wednesday, May 1st opener was a shocker. Bo Johnson of Sandpoint (a “waterfront character”) was using a spoon on 15 pound test line from a steel rod when he hooked and landed a 25 pound 10 ounze, 23 inch girth, 38 inch long Kootenay rainbow. That same day, Gene butler of Hope was using a homemade lure, silk line, and a homemade pole when he caught the second largest fish of the day at 25 pounds 7 ounces, 23.5 girth, and 35.5 inches long. The 3rd and 4th were 23 pound, 15 ounce rainbows. They were 24 inch and 25 inch in girth, 35.5 and 34 inches in length respectively. Both were caught on spoons, one on a steel rod and Penn reel, the other on nylon line and a homemade reel and rod. There were several other fish caught but not entered, including on 21 pound 4 ounce fish. What an opening day! It captured the entire back page of the Spokesman Review, normally filled with worldwide news photos at the time. This full page spread was devoted for the first time to only one community; Ross Hall’s pictures of Pend Oreille’s opening day filled the page! The second day, a five year old male fish hit an FST spoon on 18 pound line and steel rod in Ellisport Bay that weighted 27 pounds, had a 25 inch girth, and was 36 1/4 inches long. There were numerous reports of the feats of these strong fighting monsters. There were stories of cut hands and broken fingernails from attempting to slow down these screamers. There were also many reports of lost gear, including complete outfits not properly secured to boats that went to “Davey Jones’ Locker” when big fish struck. The most famous fish of the year was a 15.75 pound rainbow caught June 9th off Whiskey Rock by Bing Crosby. The picture of him with his fish was seen in newspapers and magazines all across the United States. The publicity from these was perhaps the greatest coup of the year for the Sandpoint Chamber of Commerce. The tourism gained from this one fish was enormous. Bing, originally from Spokane, truly had a great time. He spoke frequently of it and even had the fish mounted because, “otherwise, nobody will believe it!” The fish was displayed at his picture studio and a tinted picture was prominently displayed at his country club. At the end of July a new first place fish was caught by Carl Haack of Farragut. He was trolling about 500 feet of monel (steel) line off a star drag reel and a bamboo rod. He was off of Whiskey Rock and figured the line to be down about 60 feet. It was about half past six at night when a 29 pound 1.5 ounce rainbow gave him a forty minute battle. That Labor Day, Sadnpoint held it’s first annual Labor Day Celebration. The highlight was when the Idaho Governor crowned the first Pend Oreille Rainbow Queen. They even had a big parade. The winning float was the joint-entry of the B.C.S.A and the Chamber of Commerce. It was a 32 foot long float designed by (and the construction directed by) local artist extraordinaire Russ Kotschevar. It featured about a 20 foot rainbow trout, which had the club’s and chamber’s queen candidate, Bea Messmore, perched atop the float. The float was even taken to a parade in Spokane to advertise the lake derby. Lots of derby tickets were sold after that parade for chances at the prizes that would be available even if one didn’t go fishing. The next large fish of that year was caught on October 1st, a 30 pound 12 ounce Kootenay rainbow. It wasn’t registered in the Lake Pend Oreille Fish Derby because the fisherman didn’t have an entry ticket. He did have one, although for a Bayview Derby. The Bonner County Sportsmen’s Association’s sponsored derby ended October 31st. The awards presentation was held mid-November. That night four fishermen from Washington were encouraged to show off their eight fish they had caught during the previous two days. There is a picture in the newspaper of four men holding eight fish of 18 to 27 pounds, totaling over 200 pounds! There were 112 prizes awarded to people who didn’t even register fish. Jack Parker won the 16 foot boat and 5 h.p. Johnson motor. Even Bing Crosby received a case of peas. First place of $250.00 went to Ivan Haruff of Spokane with a 30 pound 12 ounce rainbow caught on Oct 5th. Second place of $75.00 went to Dr. Hamshaw of Spokane for a fish of 29 pounds, 4 ounce caught on October 12th. Third place of $50.00 went to Carl Haacke’s fish of 29 pounds, 1.5 ounces. Fourth was a 29 pound fish caught on October 28th by El Shaw of Laclede. The last day of the season came to an end Saturday, November 30th, with what was probably the finest single day’s fishing of the year. That evening, at one point in time, anglers had 606 1/2 pounds of the big rainbows at Sam Miller’s little store, the weighing station of Midas (Garfield). Approximately half of them were shown in a photograph by Ross Hall in the Sandpoint Idaho News Bulletin, December 5th, 1946. The final week also produced the season’s largest rainbow, a 31 1/2 pounder caught by E.A Kirkpatrick. Since he did not have the fish entered in the Bayview derby, Ivan Haruff, winner of $250.00 in our derby, also collected $500.00 for that derby. At the end of the season of 1946, Idaho’s Lake Pend Oreille easily clinched the title as the “Nation’s Rainbow Trout Capital”! Reported records showed a total of approximately 245 big rainbows were caught that season, although there were undoubtedly others. (There are records only of the fish entered in the derby. In fact, there were a lot of locals who never bought derby tickets, much less officially weighed their fish.) Besides the 31 1/2 pounder, five were caught which weighed more than 29 pounds, six more than 28, 14 more than 27, 15 more than 26, 13 more than 25, 16 more than 24, 21 more than 23, 14 more than 22, 14 more than 21, and 9 more than 20 pounds. It is interesting to note that the largest fish entered in the Kootenay Lake derby in Canada was 23 pounds 6 ounces. Pend Oreille yielded at least 86 rainbows larger than that. It should be noted here that in April of 1947, the brood stock program had yielded enough eggs to allow 14,173 fry between 4 inches and 9 inches to be planted. Another 6,000 fry were to be planted sometime after July 10th. This was the first batch of rainbows introduced to the lake since the planting of the Kootenay rainbows in 1943. The program was continuing to “spawn”even more positive results! At some point in the late 1940’s (unconfirmed 1948), the governor declared May 1st Kamloops Day. It was reasoned that any state could have a Labor Day or Memorial Day, but only Idaho could justify having it’s very own Kamloops Day. Opening day, May 1st, did not disappoint the eager anglers. C.C. Shepherd of Opportunity, Washington, brought to the docks a new world record, an unprecedented 36 pound rainbow trout! It was caught in Garfield Bay late in the afternoon on a trolled bass plug called a Crazy Crawler, still made and sold today. The lure creates such a splashing commotion that it was concluded that the big trout must have struck out in self defense. The happy ending was made when Sandpoint Fire Chief Claude Simon took a four foot length of pipe, welded some large hooks on it, dragged the aread where the fish disappeared, and recovered it. After all the picture taking was done, Shepherd gave the fish to the Sandpoint Chamber of Commerce, which in turn had it frozen and went to Washington, D.C., to the table of President Harry Truman. November 25th is the day that will live on in all Kam fishermen’s dreams. Wes Hamlet of Coeur d’Alene was trolling a Martin silver scale plug (or a herring scale, depending on which story you read) when histroy was made. About noon time in an open boat, he was about a mile off, or out of (since one report says he was fishing in only 10 feet of water) the mouth of Garfield. He had 400 feet of 40 pound test sunset braided nylon line let out. He was using a Pfleuger Capitol reel on a Montague rod, when the rainbow stripped out about 150 feet of line on its first run. He said it broke water three times. It was Hamlet’s 13th time out fishing on the “big hole” for the famed Kamloops in 1947 and this was the very first one he had caught. He’s not sure how much it really did weigh because he and his fishing companion continued to fish and didn’t return to the dock until after 3:30 that afternoon. It had bled a lot (back then most folks used a gaff to haul the big ones into their boats) and had dried out also. Nonetheless, Lake Pend Oreille yielded up a 37 pound World Record Rainbow Trout. Here’s to lucky 13! There hasn’t been a freshwater rainbow (meaning non-steelhead) legally caught and officially brought to any scales since that day in 1947. Again the Sandpoint Chamber of Commerce had a world record rainbow to ship back east. This time it was presented to General “Ike” Eisenhower. This picture also made the national newspapers. The 1947 derby came to an end with a total of 366 rainbows entered (another report was 374) ranging in size from 2 pounders to a new world’s record 37 pound trout. Their gross weight was 8,165 pounds, for an average of around 22 pounds. Seven were registered that exceeded in size the former world’s record fish, the 32 1/2 pounds of 1945. This included the new world record fish caught by Wes Hamlet. The other big fellows were the opening day 36 pounder, two 32 1/4 pounders, a 33 1/2 pounder and two 33 pounders. The 33 1/2 pounder was caught by Mrs. O.G. Olson in May and was believed to be the largest rainbow ever caught by a woman. A total of 33 fish weighed 30 pounds or more! Fifteen of these monsters were taken in November and eight were caught in May. Ninety three of the derby entries weighed from 25 to 30 pounds, and 130 were taken in the 20 to 25 pound class. During the five year period of (1945-1949 inclusive), Lake Pend Oreille produced five world record fish, three rainbows and two Dolly Vardens (now called bull Trout). Rainbows were 32 1/2 pounds in 1945 and 36 pounds and 37 pounds in 1947. The Dolly Vardens were 29 1/4 pounds in 1947 , and the 32 pound in 1949. I’ll mention here that these record breaking results are from a unique combination of factors that all came together at the most opportune time. In the mid 1930’s, the strain of salmon called kokanee (also called redfish, silvers, silver salmon, and bluebacks) took advantage of no dams on the Clark Fork River and migrated down from Flathead Lake in Montana. True to their reputation, they “took” Lake Pend Oreille and they literally overpopulated. They even managed to support a commercial fishery. At first they averaged 17 to 18 inches in length. Then the war came along and the fishing slacked off in the early 1940’s. Their overpopulation stunted their growth, and their size diminished to an average of only about six inches. This set the table for the newly introduced voracious Kootenay rainbow trout. With little else to do than eat these protein rich, bite-size morsels, they grew to enormous sizes. It is also an attribute that their growth wasn’t stunted by the spawning cycle of typical rainbows. Instead of spawning at 3 to 4 years old, they continued to expend their energy eating until they would first spawn at the age of 6 to 8 years old. The kokanee responded, after getting thinned out, to get back up to the average length of 10 to 12 inches. This, the perfect marriage of “Kamloops and Kokanee.” Since then, we’ve had dams constructed, mysis shrimp introduced and a myriad of other influences on our fishery that makes it doubtful that the events of the 1940’s will ever be duplicated. It was the year 1947 that Jim Parsons formed the Lake Pend Oreille Idaho Club (LPOIC) to help the Sandpoint Chamber of Commerce and Bonner County Sportsmen’s Association (BCSA) with the running of the derby. The next several years the derby was held on May 1st, then later the first Saturday of May. The derby title was later expanded to Kamloops and Kokanee Days. In 1958, it became a week long event. In the 1960’s, it boasted that it was the only one of its kind that had no entry fee. In 1980 the club added a Fall derby. The 1990’s have seen the club add the “challenge” to it’s derbies. So it appears that fifty season ago, Lake Pend Oreille was put on the map by the results of some very avid, hard working, and persistent fishermen. It was then that those giant rainbows of Kootenay Lake made a history making and record breaking splash in the kokanee-abundant Lake Pend Oreille. It was that first rainbow trout season that was the roots of the LPOIC and the still famous K&K Derby.